Edward the Confessor, (Old English: Ēadƿeard se Andettere; French: Édouard le Confesseur; 1003–05 to 4 or 5 January 1066), son of Æthelred the Unready and Emma of Normandy, was one of the last Anglo-Saxon kings of England and is usually regarded as the last king of the House of Wessex, ruling from 1042 to 1066. 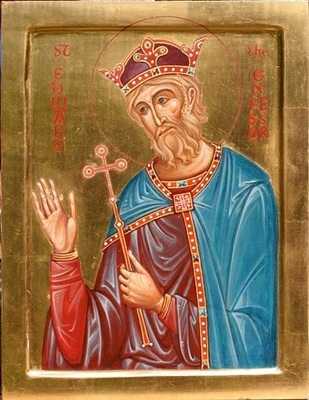 Edward was canonized in 1161 by Pope Alexander III, and is commemorated on 13 October by the Catholic Church of England and Wales and the Church of England. He was regarded as one of the national saints of England until King Edward III adopted Saint George as patron saint in about 1350.